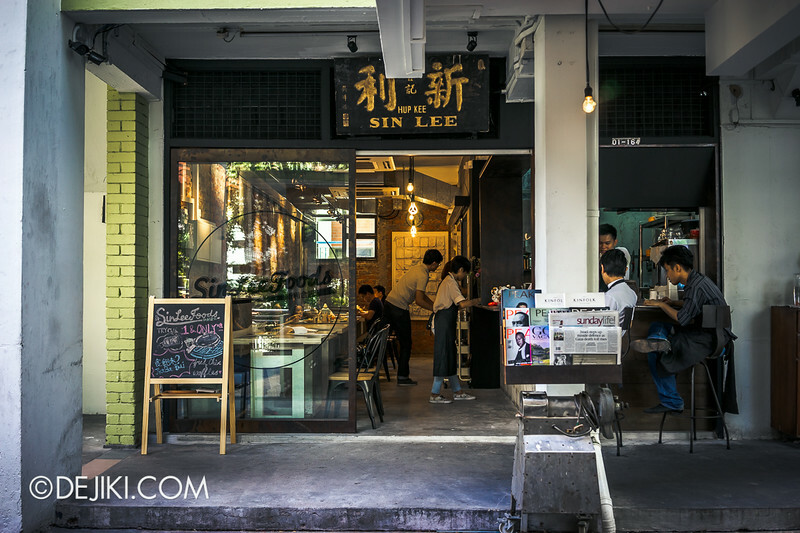 Sin Lee Foods – A cafe that’s probably too hip for Jalan Bukit Ho Swee district. 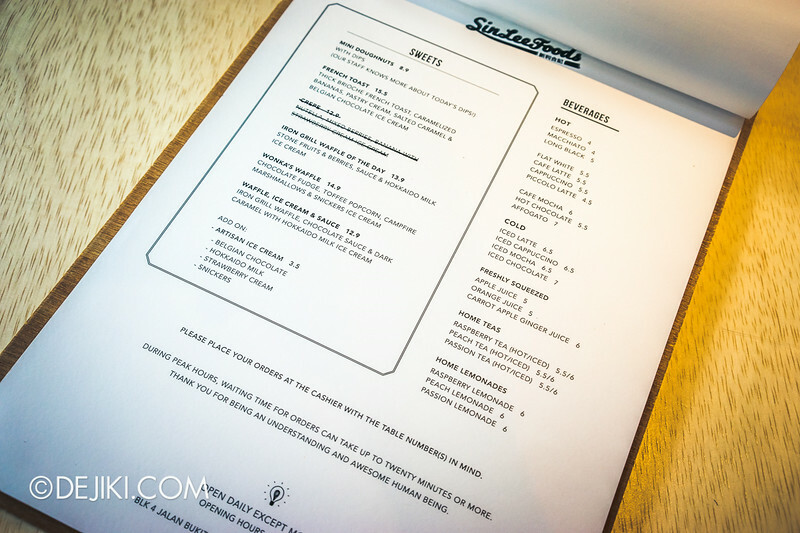 We hopped over to Sin Lee right after Tian Kee & Co. I thought we were walking the wrong way, because it was so quiet and seemed like the wrong ‘hood for a cafe. Then I saw the spiral staircase and the striped blinds at the second level. 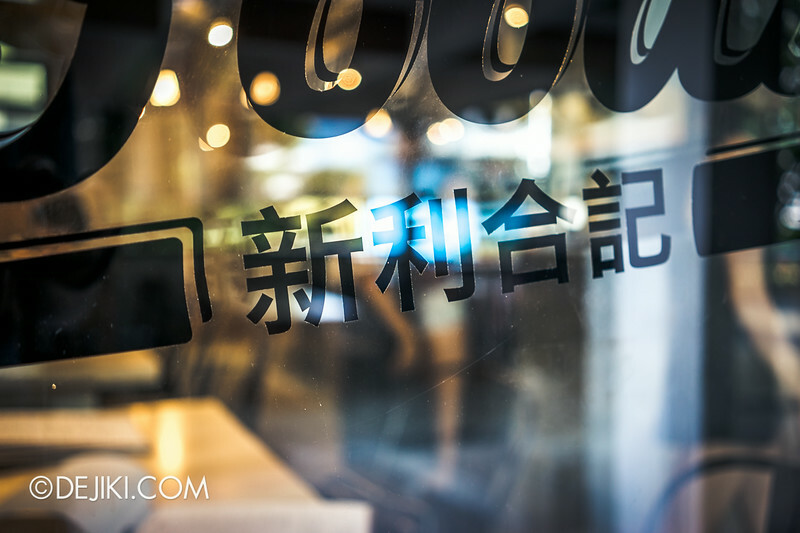 Another new cafe that kept an old signboard. I like what they did to the al fresco seating area, which is under a HDB “pavilion”. 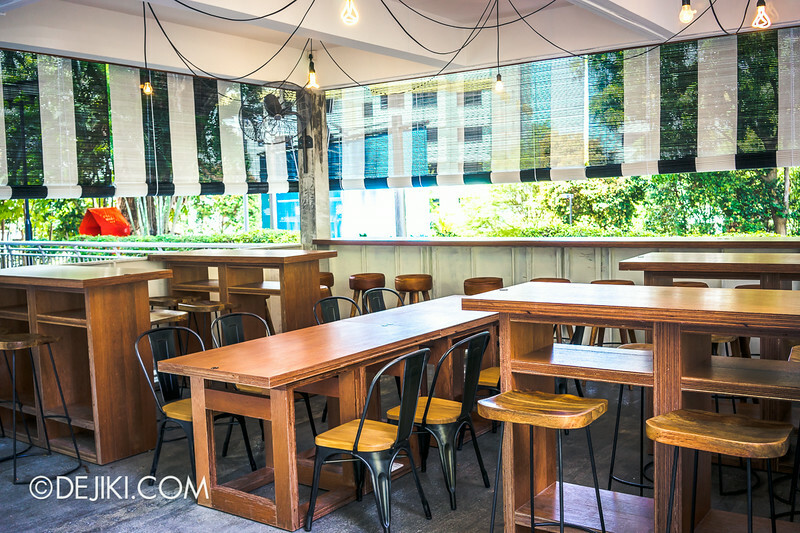 Especially when we consider that this used to be a typical coffeeshop (with those plastic chairs and round tables). 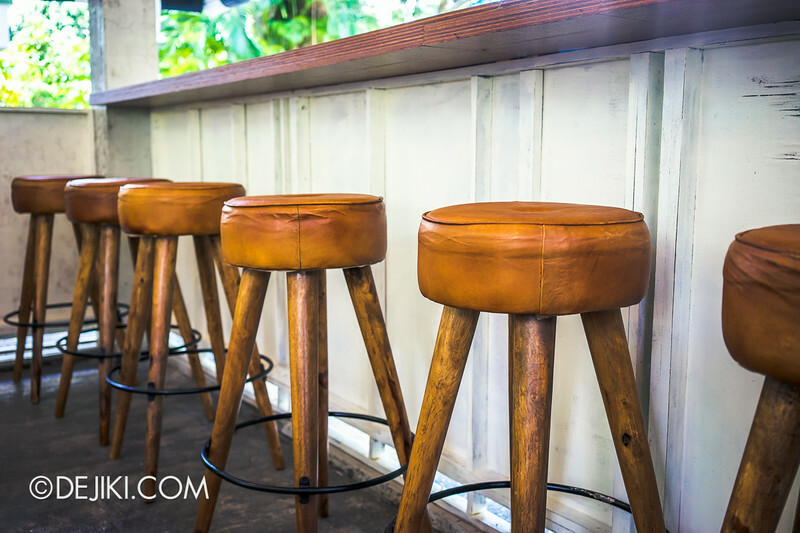 Also, that same chairs we see at other cafes? They come with nice wooden seats here. There’s even bar seating facing the main road. 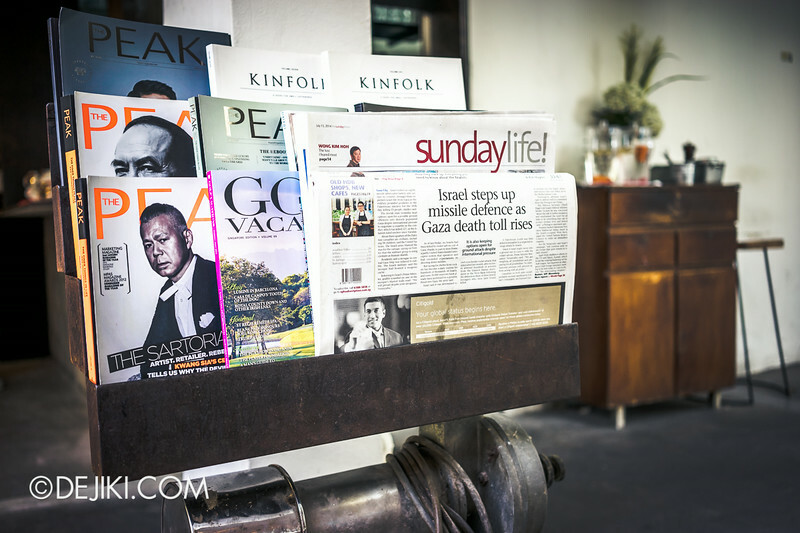 We visited on that weekend when the local papers are filled with features on some new cafes in Singapore. Thankfully we were early, as the whole place was packed when we left. The inside however, isn’t much of a surprise. The industrial look of brick walls and exposed ceiling. Tables with that unfinished, planks-put-together, look. 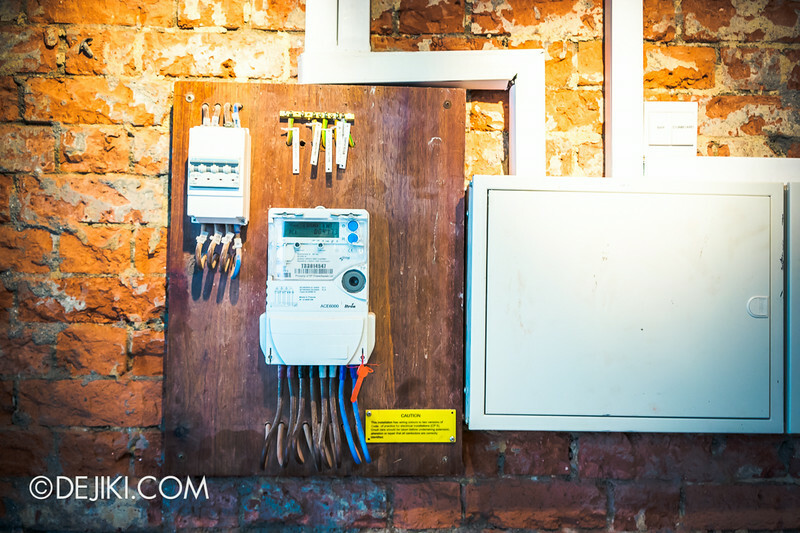 This was right above our table: Fusebox and electric meter left open for all to see. 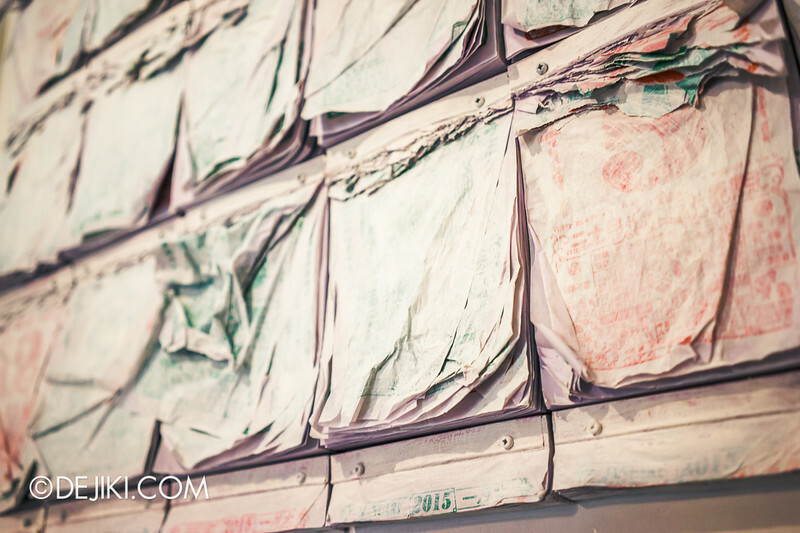 An interesting artwork awaits at the end of the cafe. 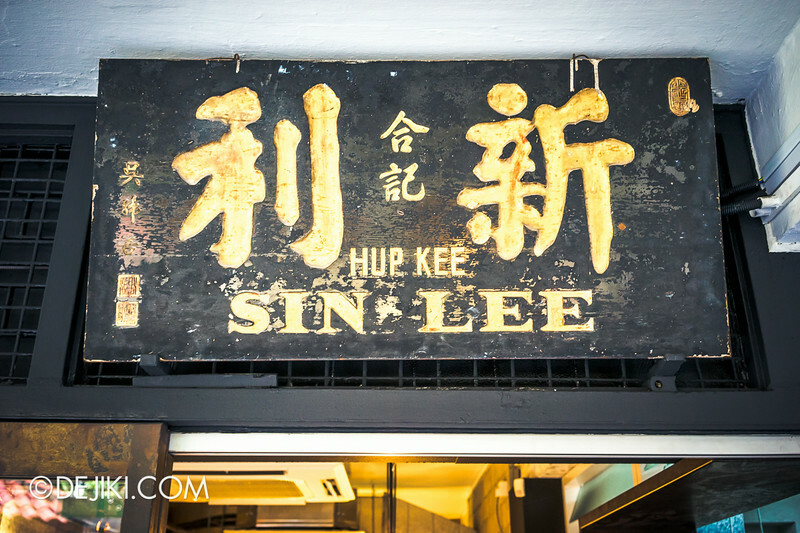 A friend told me that the old Sin Lee was famous for its prawn noodles. 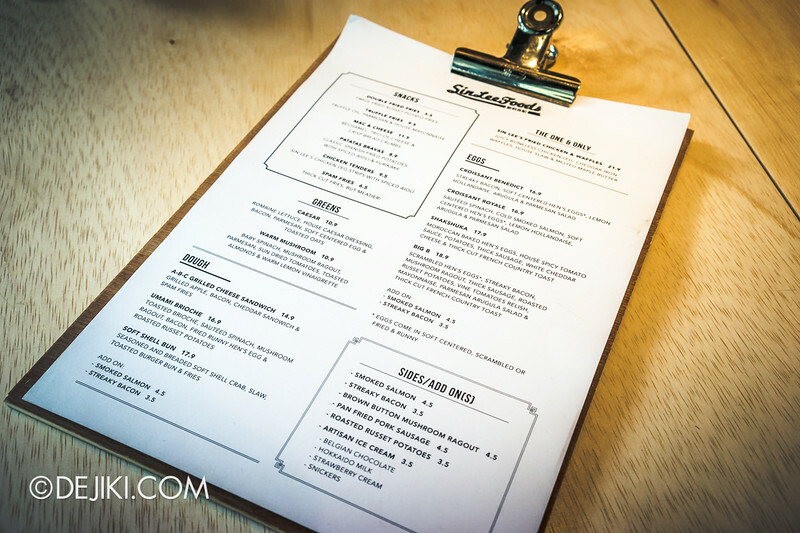 But the new cafe does not serve that – perhaps that’s why some people saw the menu and walked away. The struggle of keeping old identities. 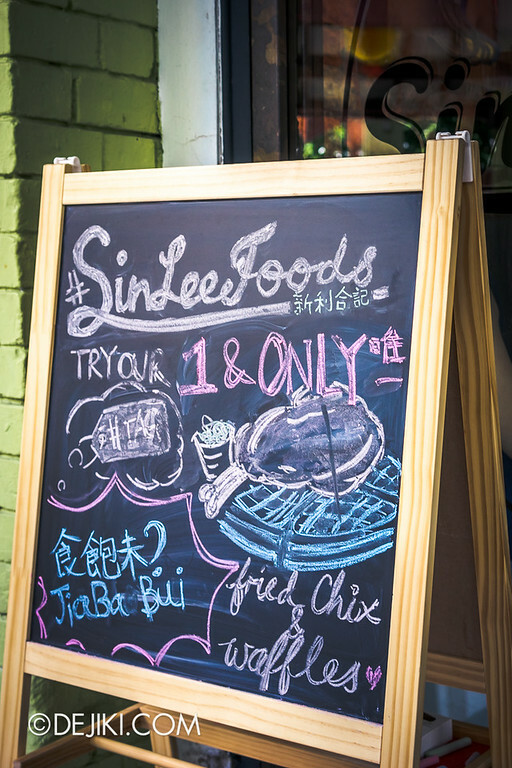 Sin Lee Foods is helmed by young chefs/owners Sean Lim and Jerraldine Chen. 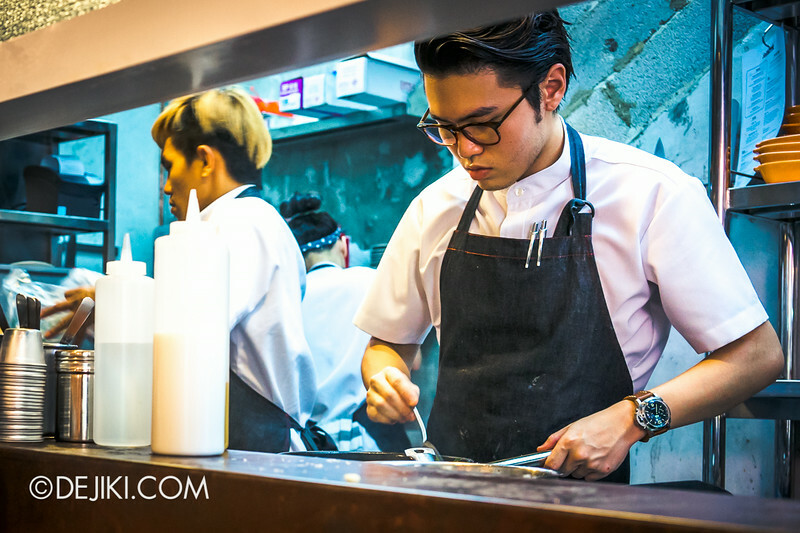 Given their past work experience in famed restaurants like Guy Savoy and Les Amis, it’s a given that prawn mee and lor mee won’t be dishes that Sin Lee will be serving (at least for now), even as a tribute to the coffeeshop’s old soul. 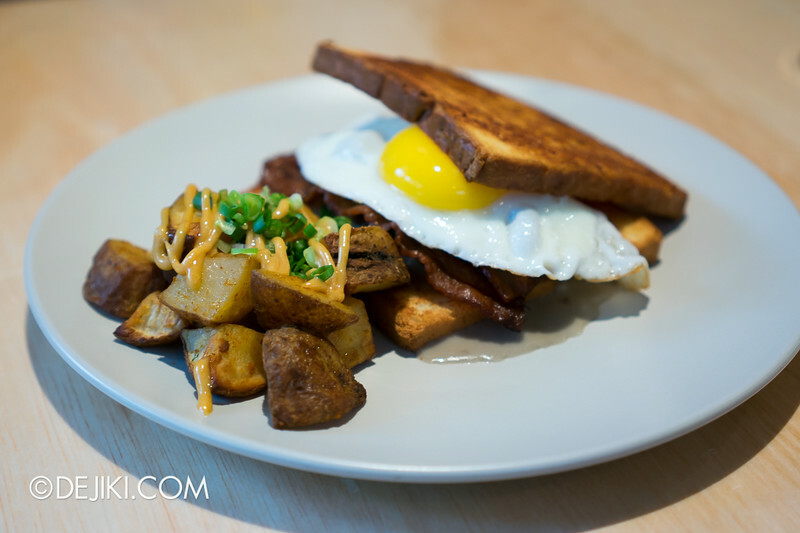 Umami Brioche ($16.90). And there we have another place with IKEA’s plates. 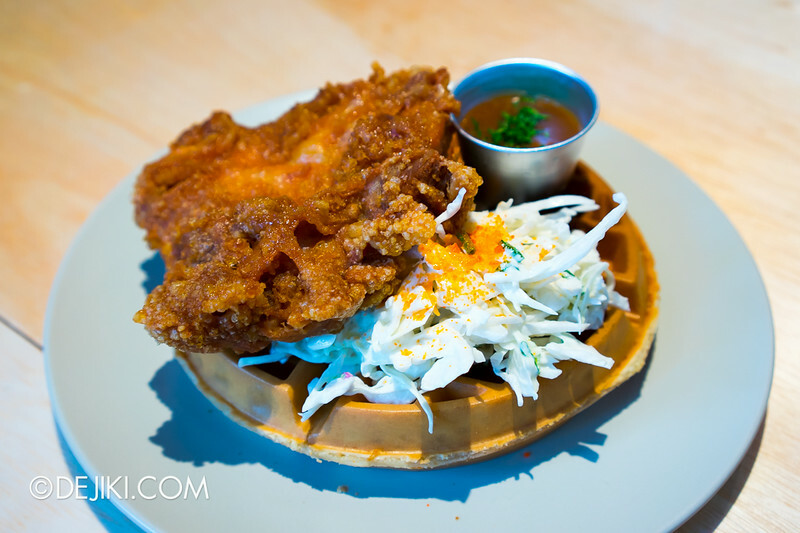 Sin Lee’s Fried Chicken and Waffles ($21.90) is the cafe’s signature dish. Almost everyone ordered that when we visited. A little oilier than I’d prefer, but it’s as good as what most people say! 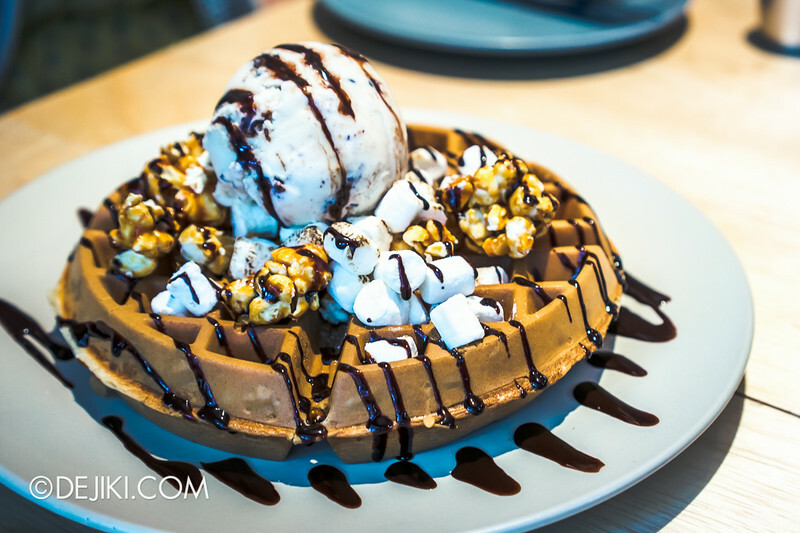 Wonka’ Waffle ($14.90). 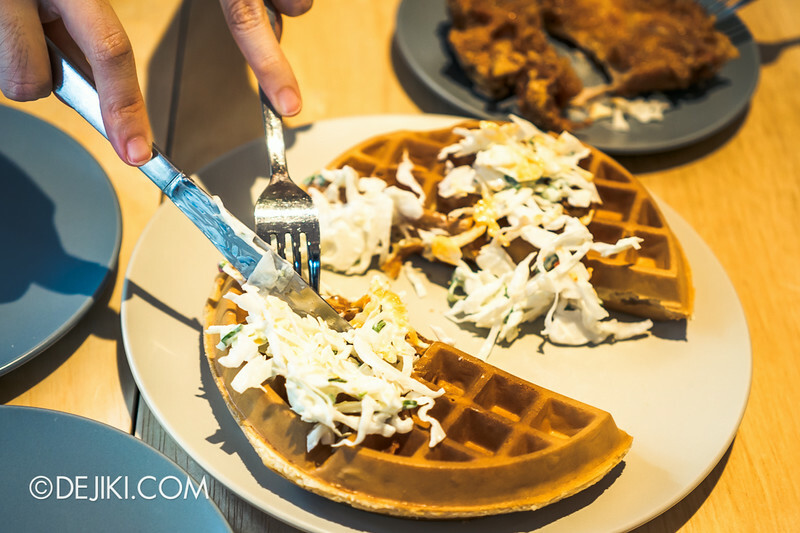 We were a bit surprised to that Sin Lee used the same type of waffle (for their famed fried chicken) for dessert. Taste wise, well – a sugar overload is just a crowd-pleaser. The popcorn was disappointingly soft, though. 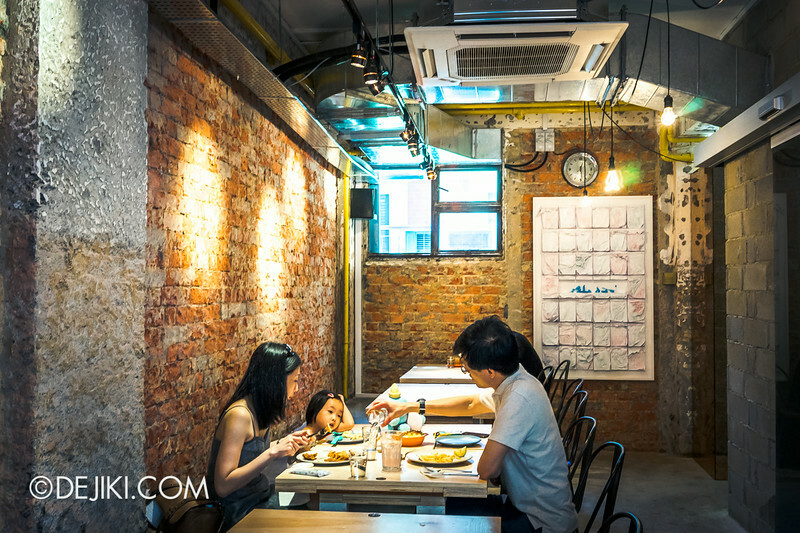 Sin Lee is a short walk from Tiong Bahru MRT. 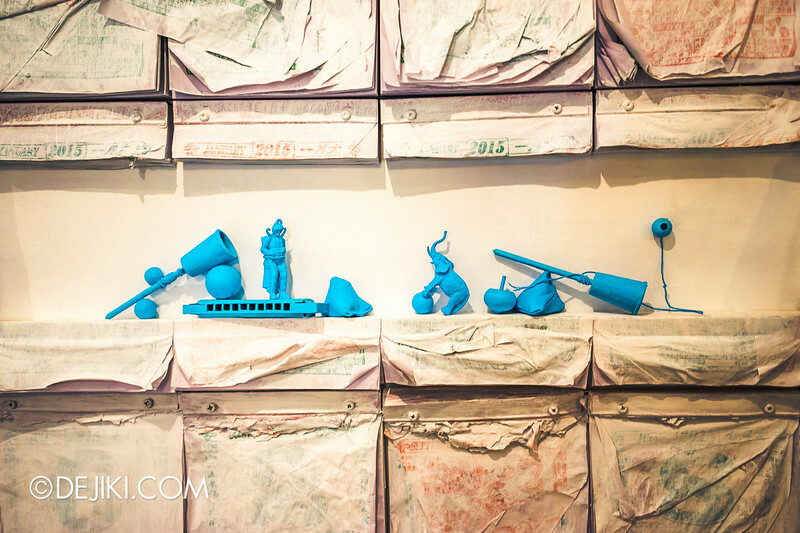 Away from the main Tiong Bahru hipster district, it rests in a really quiet neighborhood. They’ve got pretty good publicity so don’t be surprised if there’s a line, even with its ample extended seating area. Closed on Mondays. Open other days from 9:00am. Thank you for coming by! A pleasure having you with us. 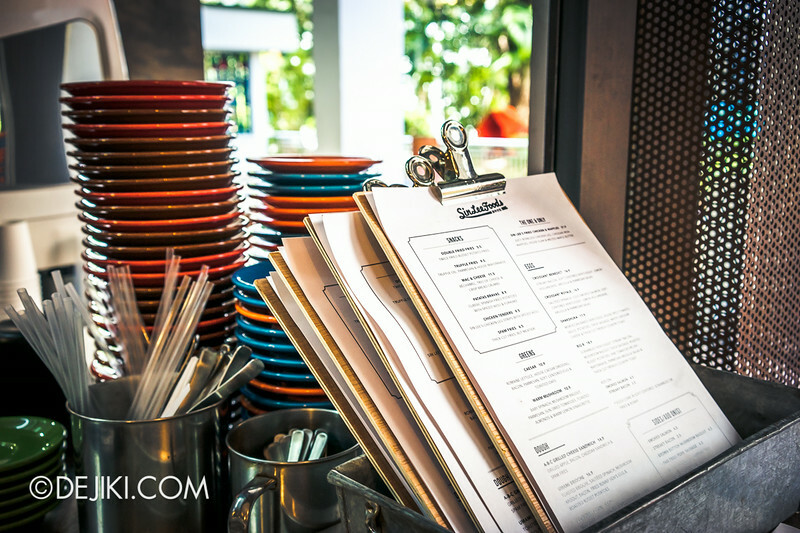 Come by again when we launch a new menu!